Lasceaux is in the Dordogne region in southwest France. 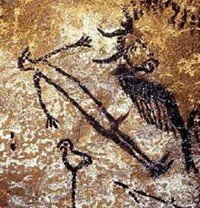 In 1940 a teenager named Marcel Ravidat, hunting for a lost dog with three friends, discovered a shaft into a cave system that had been inhabited nearly 20,000 years previously by pre-historic artists. 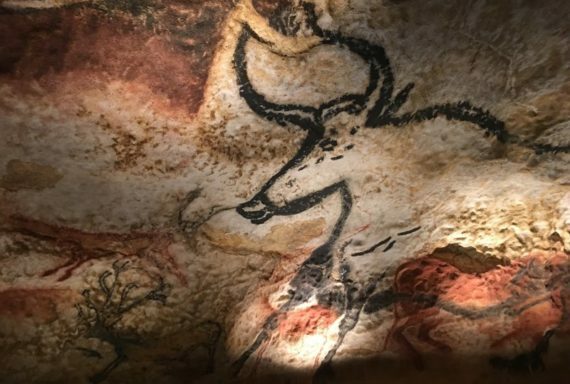 The caves contain 364 identifiable paintings of horses, 90 paintings of stags, plus cattle and bison, 7 felines, a bird, a bear, a rhinoceros, and a dead human. A painting of a dead human from the caves at Lasceaux. The paintings were created in the late Solutrean Era and early Magdalenian period [c.20,000-13,000BCE]. At that time pre-historic man existed as a hunter-gatherer living off herds of reindeer on the continental tundra just outside of the retreating ice pack. Things were different in those days. Ice Age artists had to make their own paint. “How Did Prehistoric Painters Obtain Their Colours? Inside the caves at Lasceaux. The tragedy is that after lasting thousands of years, in the few decades since the discovery of Lasceaux, the paintings have suffered extensive deterioration. Lichens and crystals began to appear on the walls in the late 1950s, leading to closure of the caves in 1963. The cause is a fungus or mould that was initially introduced by thousands of visitors during the two post war decades of public viewing. The caves have been sealed shut since 1963 in an attempt to contain the damaging organisms. In 2001, the authorities in charge of Lascaux changed the air conditioning system which was regulating the temperature and humidity. After the later system was installed, an infestation of a white mould began spreading rapidly across the cave ceiling and walls. The mould is considered to have been present in the cave soil and exposed by the work of tradesmen, leading to the spread of the fungus which was treated with quicklime. In 2007, a new fungus, which has created grey and black blemishes, began spreading in the real cave. The collection of paintings is now seriously threatened. The French authorities and international scientific and artistic communities are very concerned and a symposium is trying to solve the problem. 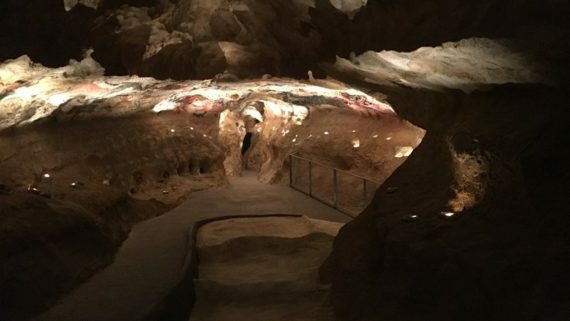 Now the French government has spent $64 million building a near perfect replica to recreate the original cave. Fortunately we do have extensive photographic records, and the three dimensional facsimile visitor attraction has been created nearby. It is accurate down to three millimetres thanks to 3D digital scanning of the actual cave. Every nook and cranny is recreated using the latest polystyrene, resin, and fiberglass techniques.